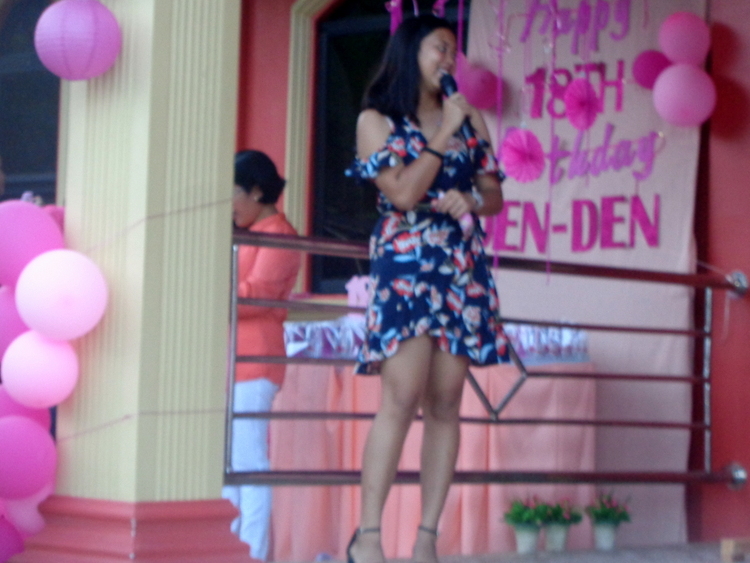 While in a previous post, I wrote about “DenDen’s 18 Candles Celebration Preparation,” this article deals with the actual celebration. 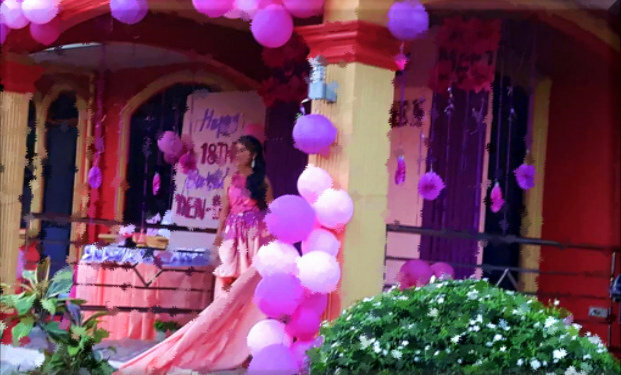 “18 Candles” is the traditional Filipino coming-of-age observance for a young woman’s 18th birthday. 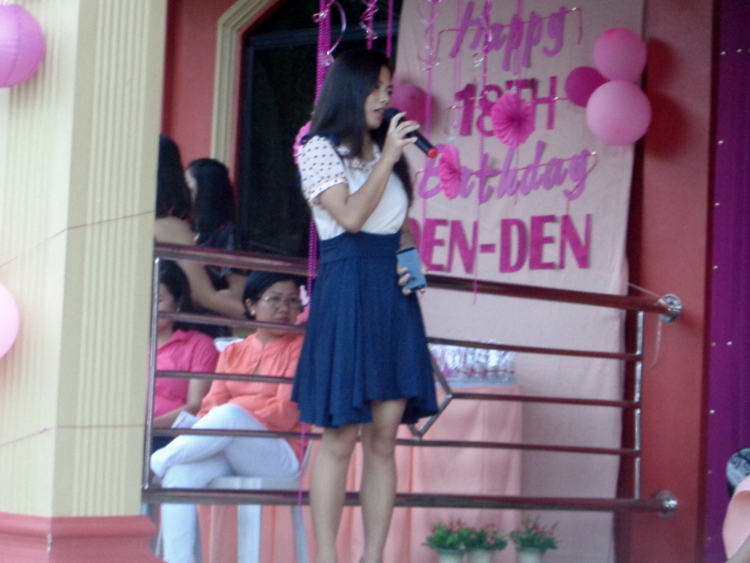 DenDen is our niece in Guimaras, the island province we call home. Surprisingly, the celebration only started an hour late. 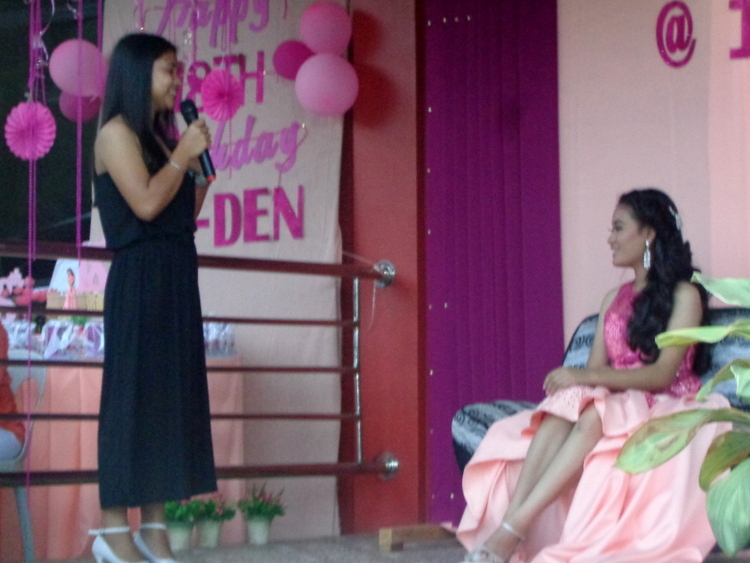 Not bad for “Filipino Time.” DenDen was in the dressing room attended by two young men who applied her make-up and helped with her gown. Most noteworthy, however, is that many of the 150 people invited had already shown up. The event eventually kicked off with an opening prayer by Mr. Reynaldo A. Osano. 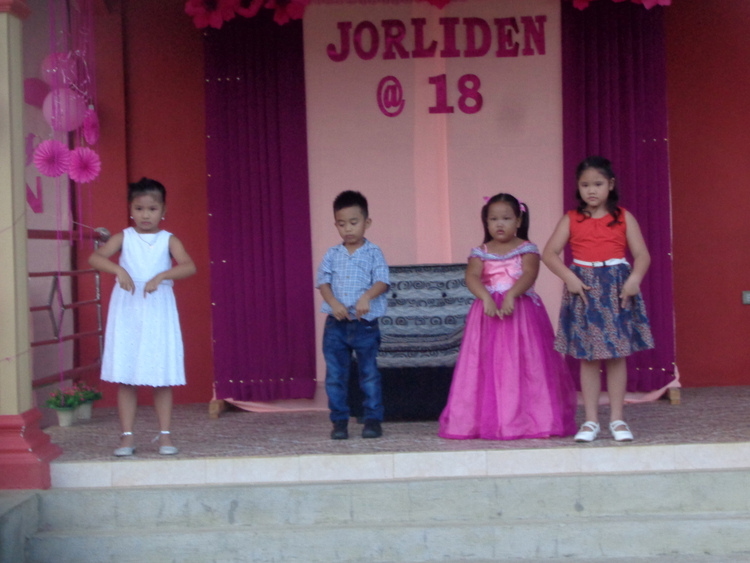 First of all, before the grand entrance of the Debutant, this adorable group of young children performed a worship song. The kids are students at DenDen’s mother Alida’s school, Guimaras Joyful School. 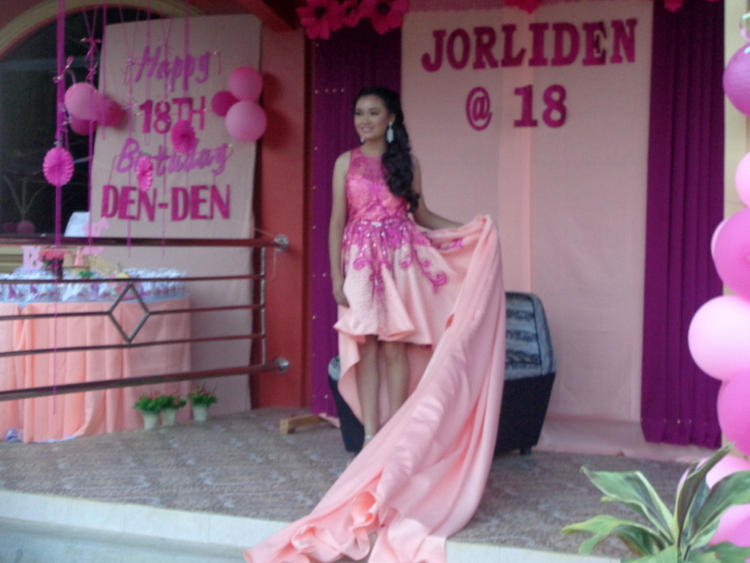 The official program then listed the introduction of the Debutant by her parents, Joery and Alida. 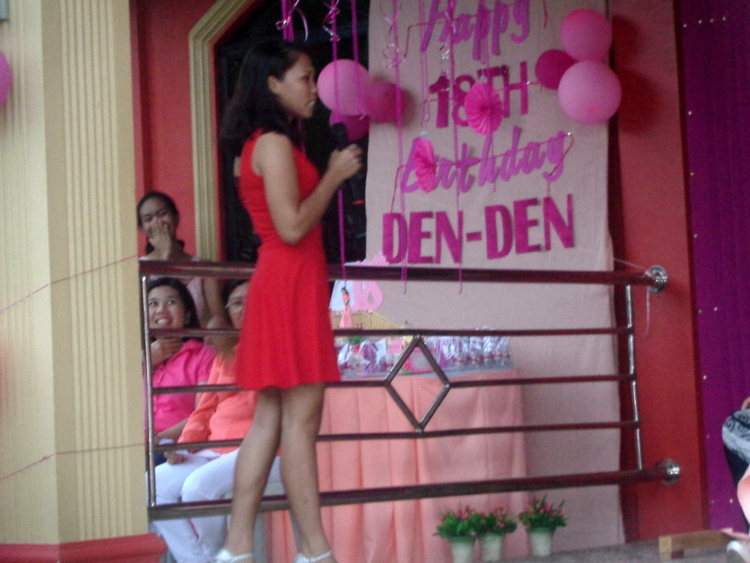 Mama Alida, the more vocal of DenDen’s parents, delivered some “Words of Welcome” to the guests. Papa Joery is not much of a talker, at least not in front of crowds. The program was just getting underway. Unfortunately for me, “Dinner,” was listed at the bottom of the official program. I usually eat my dinner early, from 3:30 to 4:00 pm. It was already 5:30 pm. 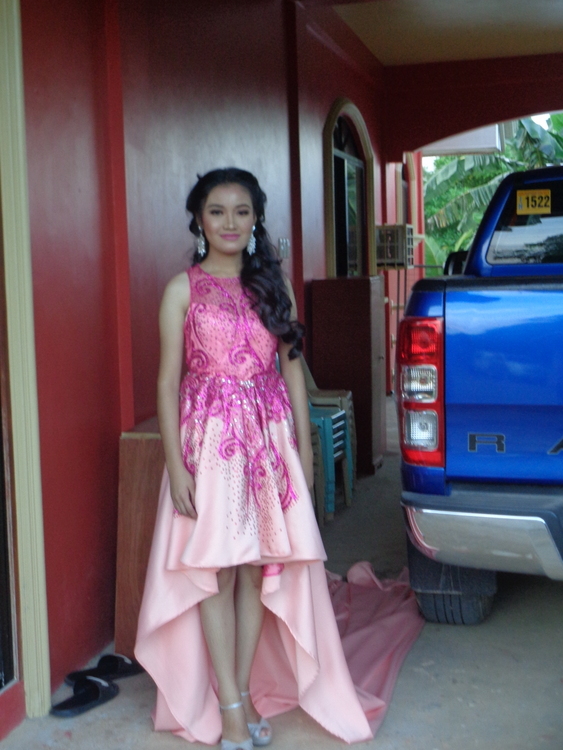 Another event was now lined up, the Debutant’s Grand Entrance. 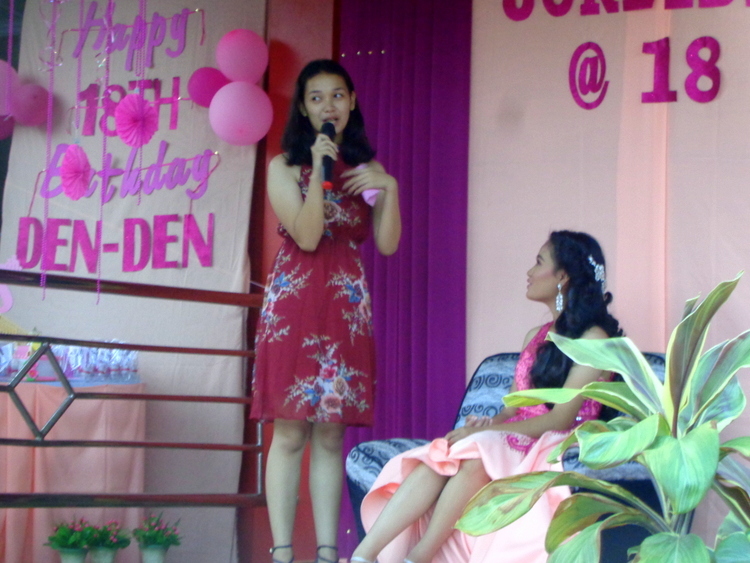 It was now around 5:30 and time for the “18 Wishes.” My stomach growled. I hoped the “wishes” would be short. 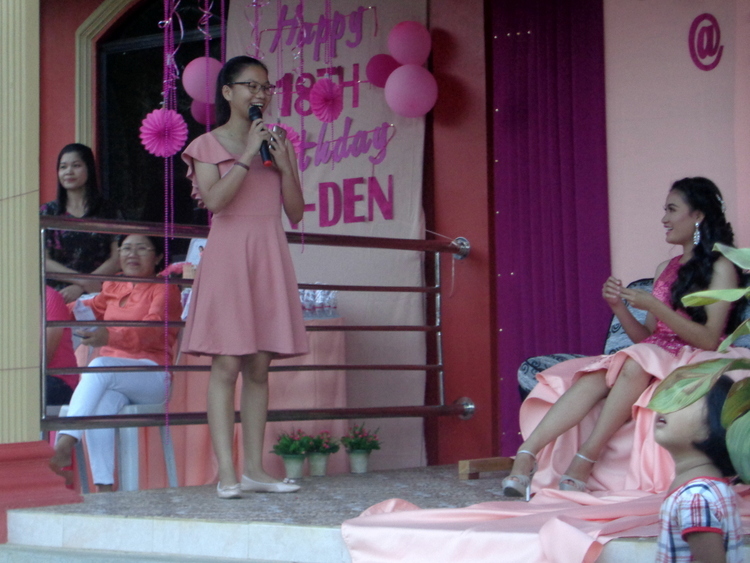 Here’s a look at some of the pretty pinays that delivered wishes to their friend, DenDen, the Debutante. That garnered a good laugh from the crowd. I finished my toast and returned to my seat. However, I was also slated to dance in the “18 Roses Dance” later on in the program. My wife of over 18 years will attest to the fact that I have no rhythm. 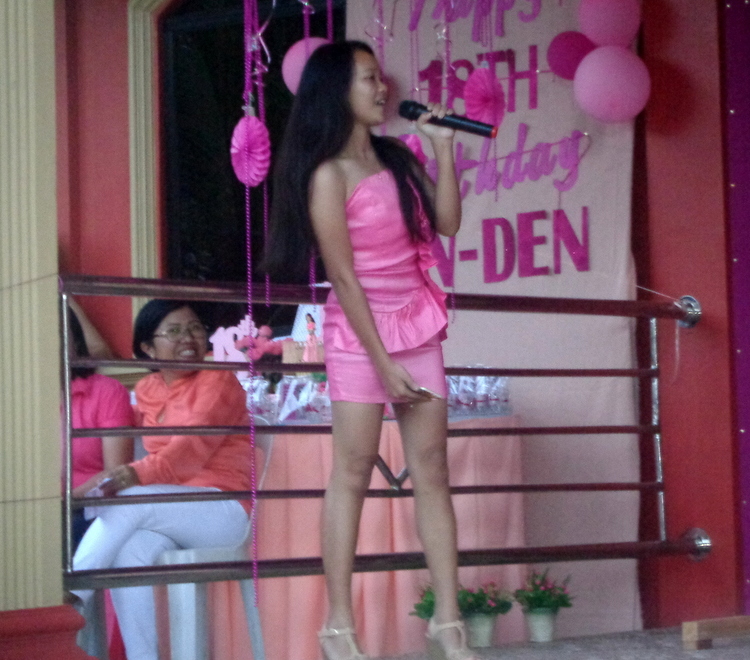 I’m a terrible dancer. Plus, I still needed some food. Dinner seemed a long way off. Would I make it to the dance portion of the program? 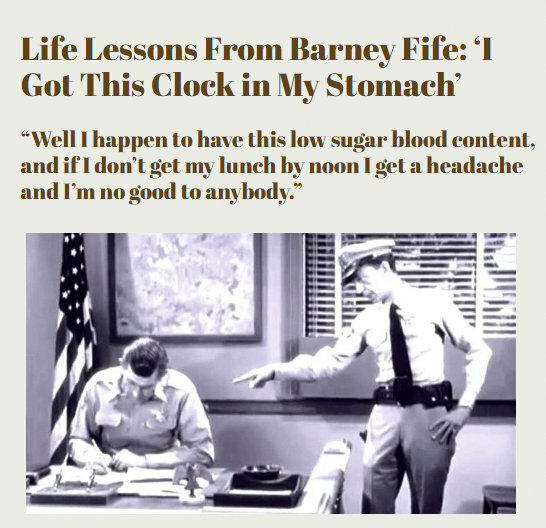 Like Barney Fife, I needed my meals on time. POST AUTHOR: "THE KANO" aka "THE CRUSTY OLD EXPAT." Dave DeWall, "The Kano", is the Publisher & Editor-in-Chief of "Philippines Plus" in publication since August 2009. He is also the CEO of Lizard Poop Productions and author of the best-selling guide book "The Philippines Expat Advisor." 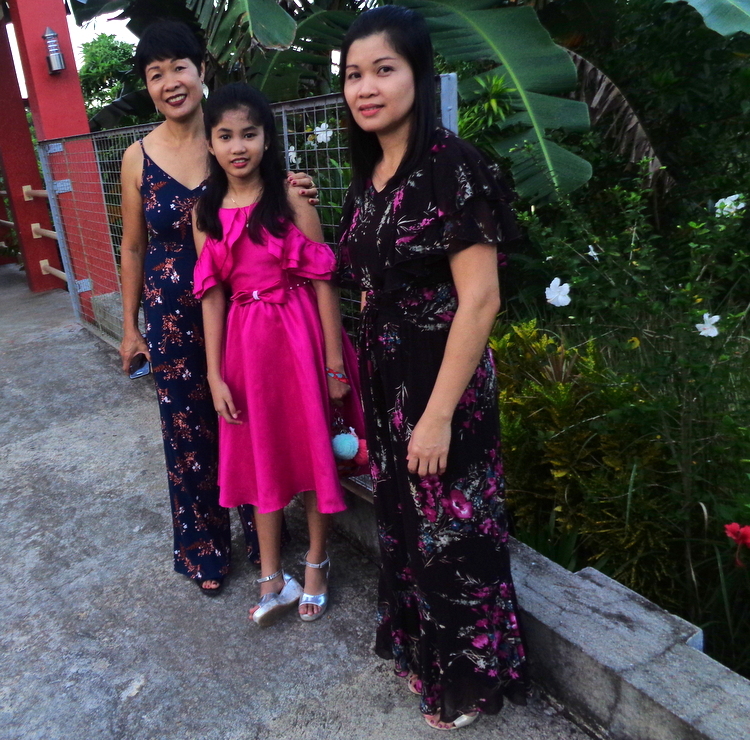 Dave moved to the Philippines in July 2009 from Central Illinois with his lovely wife of over 19 years, "The Sainted Patient Wife." 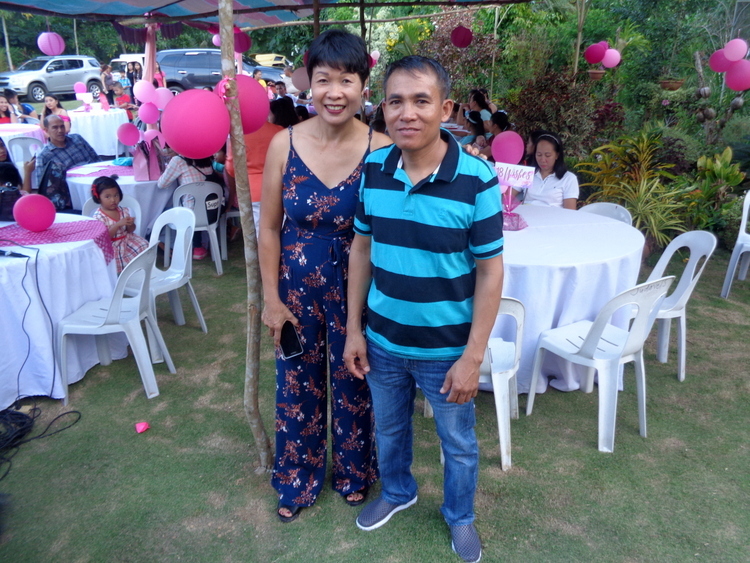 The couple reside in a rural province in Western Visayas, Guimaras. The small island province is said to have the sweetest mangoes in the world. They do not have any children but are the proud owners of eight active canines, including a Belgian Shepherd called "Killer" "Killer" has bitten five people in the last two years along with one goat and a carabao. "Killer" doesn't like strangers. Or goats. Or carabaos.